Pretty much every school-aged child I know can tell you about Ruby Bridges. Far fewer, however, maybe almost none, can tell you about Sylvia Mendez. And yet it was Mendez and her family, in Mendez v. Westminster, who actually paved the way for desegration in 1947, seven years before Brown vs. the Board of Education and over a decade before Ruby Bridges. In 1944, Sylvia Mendez and her family moved to Westminster, California. That first day, her aunt took Sylvia, her two younger brothers, and two cousins to register them in school. The aunt was told that her own daughters, who looked Anglo, could attend the school, but that Sylvia and her siblings could not. They needed to go to a "Mexican school" in another part of town. The Mexican school was far inferior. "The building was a clapboard shack and the halls were not spacious or clean. A cow pasture surrounded the school. The students had to eat their lunch outside and flies would land on their food. Their was an electric wire that surrounded the school to keep the cows in. If you touched the wire, you received a shock!" Sylvia's father, a businessman, was sure there had been a mistake. The next day he talked to the principal, then the superintendent, then the county superintendent. He consulted other families to find out whether they had received similar treatment. Finally a truck driver overheard him talking to other families, and suggested that the family should file a lawsuit. The suit went through several trials and finally ended up in the Court of Appeals, where it was decided in favor of Mendez and her family. Mendez attended Westminster schools until her family moved back to Santa Ana a few years later. She graduated from an integrated high school, then studied nursing at California State University. She was a nurse for more than 30 years, until she retired to take care of her mother, who was in ill health. "When we talk about Tonatiuh’s art it’s important to understand why he’s chosen the style that he has. In interviews the artist has discussed how his art is heavily influenced by ancient Mexican styles. As he said in an interview on the blog Seven Impossible Things Before Breakfast, “My artwork is very much inspired by Pre-Columbian art, especially by Mixtec codices from the 14th century. That is why my art is very geometric, my characters are always in profile, and their ears look a bit like the number three. My intention is to celebrate that ancient art and keep it alive.” Heads of participants are always shown from the side… There are mild problems with it, since the neutral expression of the faces can resemble dislike or distaste. This comes up when Sylvia’s cousins are accepted into the nearest public school and she is not. Their faces are neutral but read the wrong way you might think they were coolly unimpressed with their darker skinned cousin. Still, once you’ve grown used to the style it’s hardly an impediment to enjoying the story." End matter includes a note from the author, photographs of Sylvia, her parents, and the schools she attended, a glossary, a bibliography, and an index. 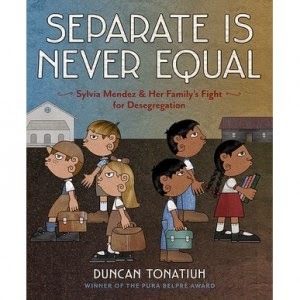 This is a really important book-- one that should be in every classroom in the United States. Sylvia Mendez's name should be as well-known as Ruby Bridges! On Friday night, I was attempting some final cleanup of the Poetry Friday Roundup. And then I got an error message from Blogspot. And then, just like that, my entire Poetry Friday post was gone. And none of the tricks I know restored it. So now I'm attempting to recreate the post, but if I forgot anyone, I apologize. Please let me know and I will add you back in. It was (thankfully, I guess now, given that I'm having to relink everything) a very quiet Poetry Friday. Robyn Hood Black shared an idea for a micro found poetry project. This would be fun to make for necklaces (teachers, think parent presents- Christmas, Valentine's Day, Mother's Day), or ornaments, or as a slumber party project. She's even tried it with middle school boys! Laura Purdie Salas has a "Kidlit Combo," an original cinquain, "The Perfect Gift," in response to Sara Pennypacker's PIERRE IN LOVE. I think this type of response would be way fun to try with kids (probably Laura has already suggested that and I just missed it). Laura's husband was having kidney stone surgery today and she requested that we send lots of healing thoughts their way. We hope everything went well today, Laura! Penny Klosterman (a great aunt) and Landon (her great nephew) have teamed up to bring us Episode #7- "Leftover Turkey." The surprise ending reminds me of one of my favorite oldie but goodie Thanksgiving picture books, Lorna Balian's SOMETIMES IT'S TURKEY, SOMETIMES IT'S FEATHERS. In another poem with a clever ending, Bridget Magee Wee Words for Wee Ones brings whole new meaning to the phrase, "Black Friday." Sylvia Vardell presented with Eileen Spinelli last week at NCTE. Eileen's poem, "Get a Life!" captures exactly how I feel about Black Friday (and shopping in general). Amy Ludwig Vanderwater captures her time with family and friends in "Grace" and promises that she will share the audio version of this poem as soon as her phone returns from Toronto (thinking there must be a story behind that one)! At Amy's other blog, Sharing our Notebooks, she announces the winners of the QUICK WRITES giveaway. Cathy Mere stopped by last night, while I was experiencing technical difficulties. Her original poem, "Yesterday and Today," reminded me of my mom and grandmother. It made me cry. Given the low turnout at Poetry Friday today, I suspect many of us are experiencing Meredith Holmes' sentiments, "In Praise of My Bed," shared by Ruth on her blog, There is No Such Thing as a God-Forsaken Town. Have you ever heard of a murmuration? I hadn't, at least until I read Diane Mayr's post today. A murmuration, it seems, is a flock of starlings, who fly in beautiful, almost choreographed patterns. Read Diane's original tanka, then watch the video of this glorious bird ballet. Wow! Donna, at Mainely Write, had quite the Thanksgiving this year. A storm knocked out the power at her house, so she had to transport Thanksgiving dinner an hour south. "A Question of Snow" is actually a poem Donna had written (probably on another snowy day in Maine) but it definitely fits the weather in the Northeast right now. Carol Varsalona wrote "Fall's Transition" in response to the snowy weather she is currently experiencing in Syracuse. She wants readers to remember that she will be collecting original poems and photographs for her Fall Festival until this Friday. At Year of Reading, Mary Lee Hahn has a light-hearted original poem in response to this year's first snow. Earlier this week, Mary Lee reviewed Bob Raczka's new December poetry book, SANTA CLAUSES, and has decided to try writing an original haiku every day in December. 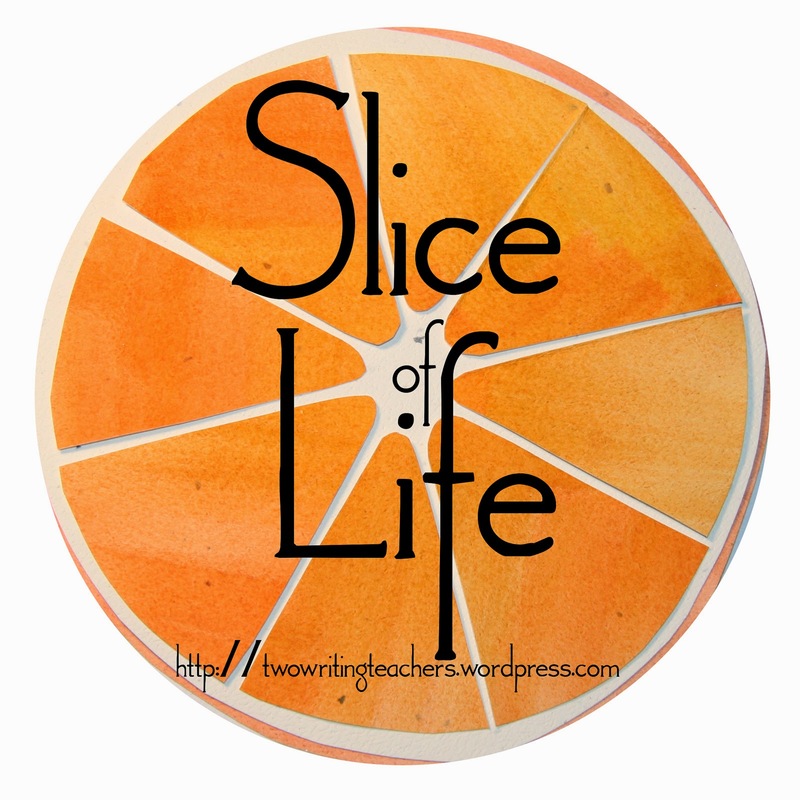 She'd like us to join her in this endeavor at her new poetry blog, POETREPOSITORY. In the Pacific Northwest, Ramona is singing the praises of rain with an original haiku. She also mentions a book, ONE BIG RAIN: POEMS FOR RAINY DAYS, that sounds like a terrific addition to any poetry collection. I see Betsy Hubbard's name every week at Two Writing Teachers and her Chalk-a-brations show up throughout Kidlitosphere, but she says it's been a few months since she last posted at Poetry Friday. She's in today with two original poems she worked on at NCTE. Michelle H. Barnes is wrapping up a month of collecting monstrously good haiku from lots of Poetry Friday friends. This challenge ends Tuesday and participants will be eligible to win a copy of SANTA CLAUSES. And even if you aren't inclined to write a monster haiku, you can still enter the drawing, by commenting on Michelle's post before Tuesday. At Gathering Books, Iphigene invites us to visit the world of Tolkien, through one of his ballads, "Far Over the Misty Mountain." I'm not a big fantasy fan, but when I listened to the Youtube version of this ballad, it made me think I might add THE LORD OF THE RINGS TRILOGY to my TBR list for 2015. Irene Latham, who describes herself as a thrift store shopper, has a recently re-illustrated and re-relased book, "I Like Old Clothes," by poet laureate, Mary Ann Hoberman. Be sure to listen to Mary Ann's reading of this delightful poem! Thanks, too, to Linda Baie and Cathy Mere for stopping by to comment today, even though they weren't posting their own poems. Got any young doctors or scientists hanging around at your house? 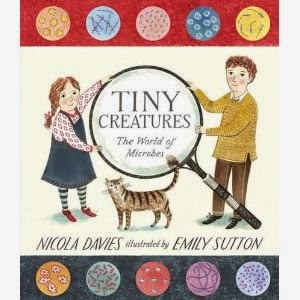 If so, Nicola Davies, TINY CREATURES: THE WORLD OF MICROBES is sure to delight! that millions could fit onto this ant's antenna? as big as a whale to show them to you? The use of scale in this book is so clever-for example, the picture of a giant ant's antenna on the first page, then on another two page spread- a single drop of water can hold twenty million microbes, that's about the same as a the number of people in New York State has a picture of apartment buildings with people's heads, or yet another, "a teaspoon of soil can have as many as billion microbes, that's the same as the number of people in the whole of India. I'd love to have the illustration from the India page hanging in my living room! Davies goes on to explain some of the different jobs microbes play in the universe- how they decompost soil, wear down mountains and build up cliffs turn milk into yogurt, and make people sick and well. Emily Sutton's illustrations are detailed and perfect. Read the NY Times review here. I'm not surprised to discover that the SCIENTISTS IN THE FIELD series has several (at least four, I think) books on the CYBILS nonfiction list. Today's offering, SEA TURTLE SCIENTIST, follows Dr. Kimberly Stewart, the "turtle lady," in her efforts to save the sea turtles of Saint Kitts and Nevis. The reader follows Stewart in her midnight watches of enormous mama turtles crawling up onto the beach to lay eggs, and her digging of nests that have hatched. 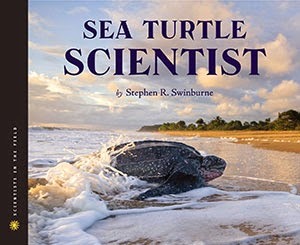 The book includes chapters on how the turtles hatch and begin their journey, how the community is working to save the turtles and interestingly, a chapter on a native from Saint Kitts, that used to hunt sea turtles, but now works with Stewart on her conservation effort. Swinburne presents the complexities of conservation- the local people depend on sea turtles for food and use the shells to make jewelery, which is a source of income. The story of Stewart's work is interspersed with numerous (I counted at least ten) related articles, e.g. WIDECAST (a Caribbean organization that works to save sea turtles), sea turtle facts, a history of Saint Kitts, how sea turtles are killed, etc. Back matter includes a glossary, a selection on how to help sea turtles, another on how to adopt sea turtles, and a bibliography of books and websites for further reading. By the time I was finished reading, I had resolved to stop using plastic grocery bags and also to go on an eco-vacation to a turtle preserve. I love books that talk about how people work. And the grit that it takes to make something happen. And how many "mistakes" have to happen before an invention is successful. 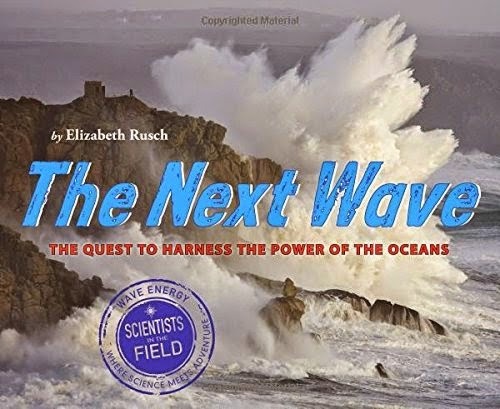 It makes sense, then, that I would love Elizabeth Rusch's newest book, THE NEXT WAVE: THE QUEST TO HARNESS THE POWER OF THE OCEANS, explores the work of three different teams, all working to harness the power of waves to generate energy for homes and businesses. First, Rusch takes into the lives of Mike Morrow and Mike Delos-Reyes, two kids who liked to take things apart. The two attended Oregon State University, where they invented a wave device for their senior project. Twenty years later, they dragged out their design and founded M3Wave, a company committed to harnessing the power of the ocean. Annette von Jouanne is a professor at Oregon State University (she wasn't there when Morrow and Delos-Reyes attended). As an electrical engineer, she is concerned "about our heavy use of nonrenewable resources, how much we burned fossil fuels for energy, and all the pollution that they made). Rusch details Von Jouanne's team as they try, and fail, and adjust, and try again, over, and over and over. Finally, Rusch invites her readers to visit the work of a third company, Ocean Power Technology, which "might be the first in the water to provide real energy to real people." THE NEXT WAVE is part of the SCIENTISTS IN THE FIELD series. Like other books in the series, the book not only includes terrific information, but it's also beautifully designed. Color photographs enhance the text on pretty much every page. There are numerous side bars and pull out articles, maps and diagrams, to build the readers' understanding of the topic. End matter includes a glossary, carefully detailed sources and places where the reader can go for more information. I have not seen them for eleven long months. I have so looked forward to having them home. To dishes in the kitchen sink. Dirty socks on the floor in family room. And yet this is a very hard week to parent. I have loved my chocolate-skinned sons as best as I can. Cooked and cleaned and driven. Done without so they could have. I am not their mother. on a hot summer night. I do not know what really happened. Owen and Mzee? Balto? Keiko, the whale who starred in FREE WILLY? Smokey the Bear? Sea Biscuit? You probably know all of these animals, but what about Binta Jua, the gorilla mom who picked up a little boy who somehow fell into the cage at Brookfield Zoo and carried him to her door, so none of the other gorillas could hurt him? Or how about Pale Male, a red-tailed hawk that makes his home on Fifth Avenue, in New York City, and has fathered a hundred or more other urban dwellers? Or what about the Tamworth Two, two hogs that fled the slaughterhouse and escaped into the woods of England in 1998? These are only a few of the animals that are included in ANIMAL STORIES: NINETEEN TRUE TALES FROM THE ANIMAL KINGDOM by Jane Yolen and her three children, Heidi, Jason, and Adam Stemple. 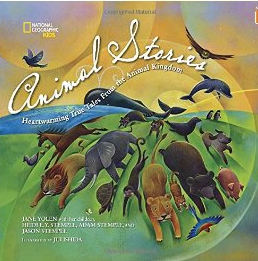 Each of the 19 narrative nonfiction stories included in the book is about a different animals, and is accompanied by a short nonfiction piece about the animal or a related topic. End pages include a brief synopsis of each story, a world map, a timeline, an authors' note, and resources for further reading. Each story also contains several full color illustrations, making the book more accessible to younger readers. A great gift for an animal lover! Our second graders do a unit on advocacy each year. I'm always on the lookout, then, for books about people who are advocates, especially in a way that children will understand. 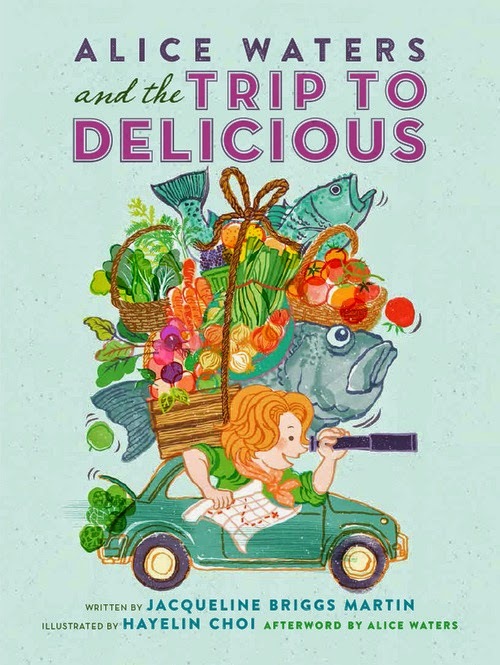 ALICE WATERS AND THE TRIP TO DELICIOUS, by Jacqueline Briggs Martin, author of SNOWFLAKE BENTLEY and more recently FARMER WILL ALLEN AND THE GROWING TABLE, definitely fits into that category. Alice Waters spent part of her young adulthood in Europe, tasting yummy foods, then opened a restaurant, Chez Panisse. At the time most chefs were men. And most restaurants worried about finding good recipes, not good ingredients. Alice Waters changed all of that. She cooked with only the freshest ingredients and her restaurant became hugely popular. Alice was the first woman to win the James Beard Chef of the year. She cooked for presidents and for the Dalai Lama. care about everyone having enough to eat. Kids who get to Delicious can change the world. This is illustrator Haelin Choi's first picture book, and her playful illustrations capture the essence of the book. 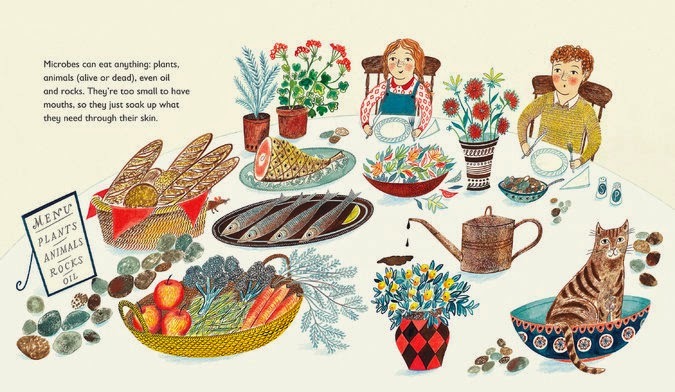 Back matter includes an afterword by Alice Waters (advice for kids about growing and eating food), an author's note, a list of resources for further research, and a bibliography. "Every September, the great white sharks return to San Francisco. Their hunting grounds, the Farallon Islands, are just thirty miles from the city. While their 800,000 human neighbors dine on steak, salad, and sandwiches, the white sharks hunt for their favorite meal." So begins NEIGHBORHOOD SHARKS, Katherine Roy's debut picture book, which is probably one of the most unique books I've read recently. The first few pages appear to be typical picture book format, with two or three lines of text on a page. About the fifth page, however, that format changes, to more an upper grade nonfiction type book. The first text-heavy spread describes the pinnipeds (seals and sea lions) that live on the Farfallon Islands, and the scientists that study them. The next five two-page spreads are devoted to five unique adaptations that enable sharks to effectively hunt seals. Did you know that sharks pectoral fins provide lift in the water, similar to the wings on a jet plane? Or that they have a complex web of arteries and veins that acts as a heat exchange system, which through swimming, increases their body temperature, and allows them to digest food and move more quickly? Or that their jaws aren't fused to their skulls, but instead can be projected forward, so that they have maximum bite force? After describing these adaptations, Roy switches back to typical picture book format for a few more pages, before going back to a few more text-heavy spreads that describe the scientists' process for tracking sharks, the great whites' place in the food chain, and their migration process. 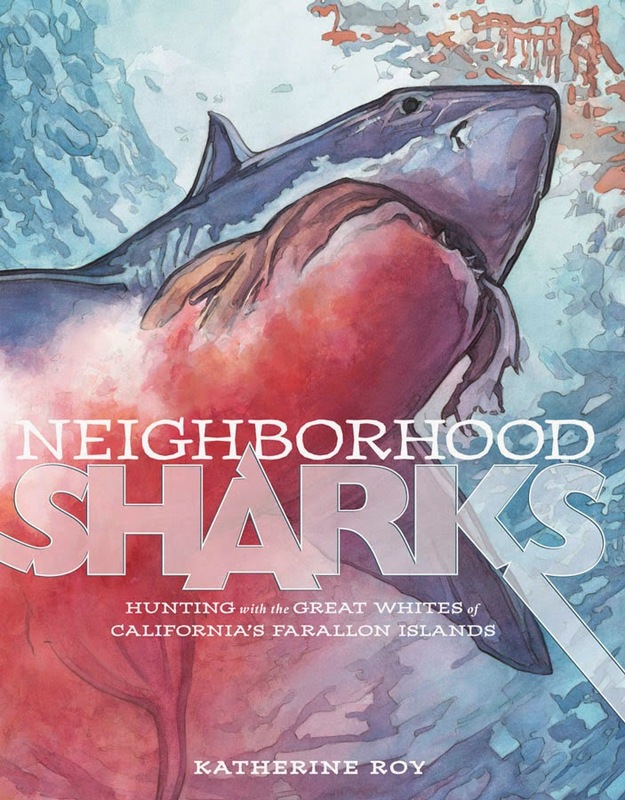 Katherine Roy studied under David Macauley at the Rhode Island School of Design, and the water color illustrations in this book are incredible- the way she captures the sharks' movement and attack feels as real as, well, as real as watching the shark attacks in JAWS. Kids are going to love the illustrations. The book also includes lots of beautiful labelled diagrams, which they are going to enjoy just as much. A terrific book for classrooms and Christmas presents! Katherine Roy wrote a post for the Nerdy Book Club about a month ago. And was interviewed by Mr. Schu here. And here's a really interesting blog post about the process Katherine Roy used to create SHARKS. And another link to her sketchbooks. 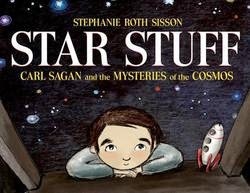 Carl Sagan seems a pretty complex guy for a picture book, but Stephanie Roth Sisson manages to make his life accessible to kids in her biography, STAR STUFF: CARL SAGAN AND THE MYSTERIES OF THE COSMOS. Sisson traces Sagan's life from his boyhood, growing up in the Bronx and attending the 1939 World's Fair, (I especially loved a page where Sagan goes to the library to get a book about stars and is first given a book of Hollywood stars) to his adulthood fascination with planets and stars, including his work on the Voyager. Throughout the book, Sisson manages to convey Sagan's continual curiosity and wondering. Several vertical and foldout pages emphasize the immensity of the universe and add to the visual appeal. End pages include a note from the author, information on sources, and a bibliography. 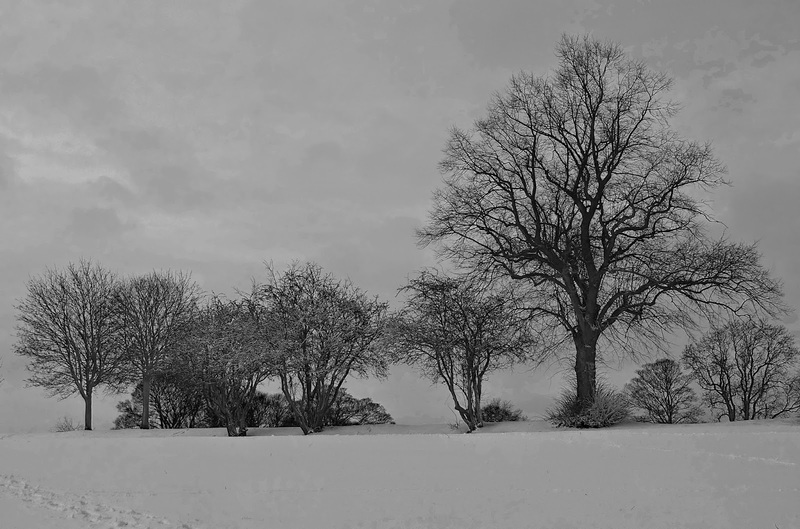 All last week, weather forecasters predicted a cold front. Temperatures were going to be in the twenties, they said. 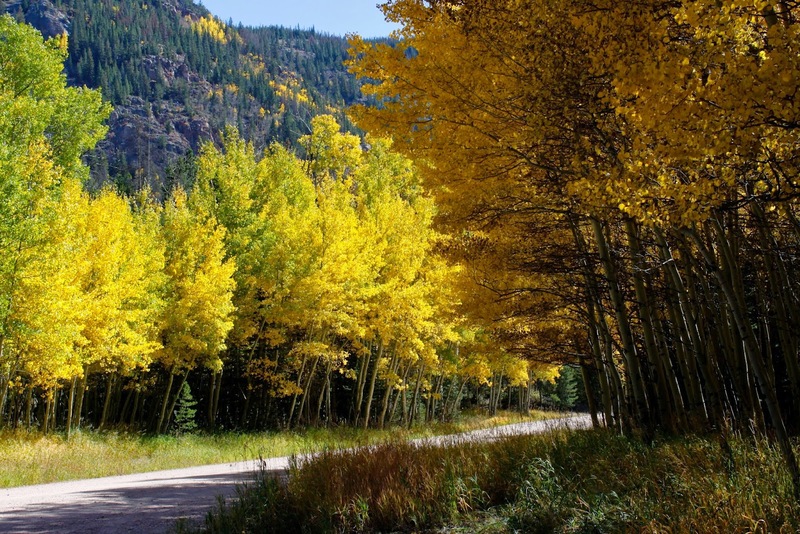 The weather at that point, however, was glorious-- temperatures in the mid-sixties, red/yellow/orange remnants of fall coloring the landscape, and it was hard to believe that winter was coming. "A SEVERE LACK OF HOLIDAY SPIRIT"
Ice forms everywhere, a plague of glass. Check out other Poetry Friday offerings at Keri Recommends. 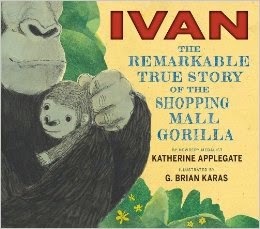 G. Brian Karas illustrations are pretty close to perfect. He describes his illustration process here. Back matter includes two pages, "About Ivan," as well as some words from Jodi Carriage, Ivan's main keeper at Zoo Atlanta, who says, "Ivan loved to paint, which was evident by how quickly he came right over and made delighted sounds when I got the painting supplies out. I would hold out the colors and he would paint to the one he wanted to use-- his favorite color was red." I'm tucking this one into my bag to take to school today. I can't wait to share it with kids! A young halibut has an eye on each side of its body. As it gets older, however, one eye migrates over the top of the fish's head. Eventually, both eyes end up on the same side. The halibut spends most of its adult life lying on its side on the bottom of the ocean, and the arrangement means that both eyes will be directed upward, away from the sea floor. The bullfrog doesn't appear to see things that aren't moving. It eats insects, but face-to face with a motionless fly, it will starve to death. The Eurasian buzzard has the sharpest eyesight of any animal. Its vision is eight times more accurate than ours-- keen enough to home in on a rabbit two miles away. 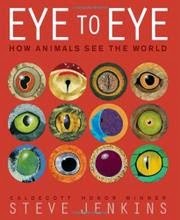 End pages include the evolution of the eye, a page with a few more facts about each featured animal, a bibliography and a glossary. 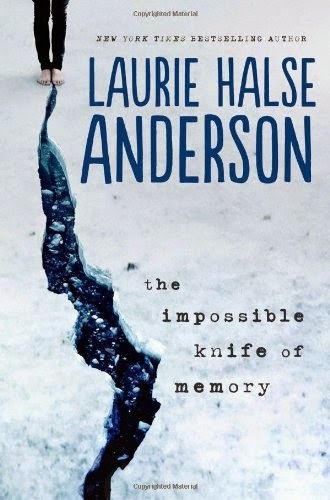 I'm a huge Laurie Halse Anderson fan. When I saw the the impossible knife of memory in the audiobooks area at the library, I grabbed it right away and have been listening to it in the car for about two weeks. I loved impossible knife and am thinking I'm going to have to buy the book to share with the eighth graders at my school. 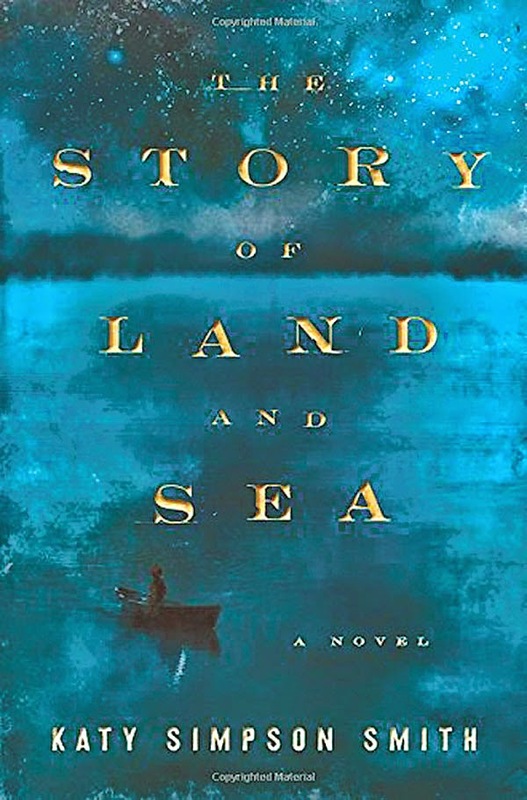 THE STORY OF LAND AND SEA was my adult book club novel for this month. It's historical fiction, set in coastal North Carolina, during Revolutionary War times. I love historical fiction and expected to love this one, but quite honestly, despite the carefully crafted literary writing, I really didn't. THE STORY OF LAND AND SEA is about a ten-year-old girl named Tabitha, her father John, and her grandfather Asa. Other major characters include Tabitha's slave, Moll, and her son, Davy. The book is divided into three parts- the first about Tabitha, the second mostly about John, and the third mostly about Asa and Moll. When the book opens, Tabitha, a lover of the sea, is about to turn ten. On her birthday, she contracts yellow fever and becomes very ill. Her father, hoping the salt air will cure her, decides to takes her on a ship, bound for Bermuda. The second part of the story is devoted mostly to John. He was a poor orphan, who eloped with his much more well-to-do wife, Helen, after her father refused to allow them to marry. The third part of the book is devoted to Asa, Helen's father, a "god-fearing" politician who keeps slaves, and worries about his granddaughter's salvation. Author Bethany Turk was a receptionist at One World Financial Center, on 9-11. About a month later, attempting to make sense of that event, she attended a lecture by Arun Gandhi, grandson of Mahatma Gandhi. Gandhi's lecture included a number of stories during that lecture and Hegedus wondered how these stories might be made into picture books. 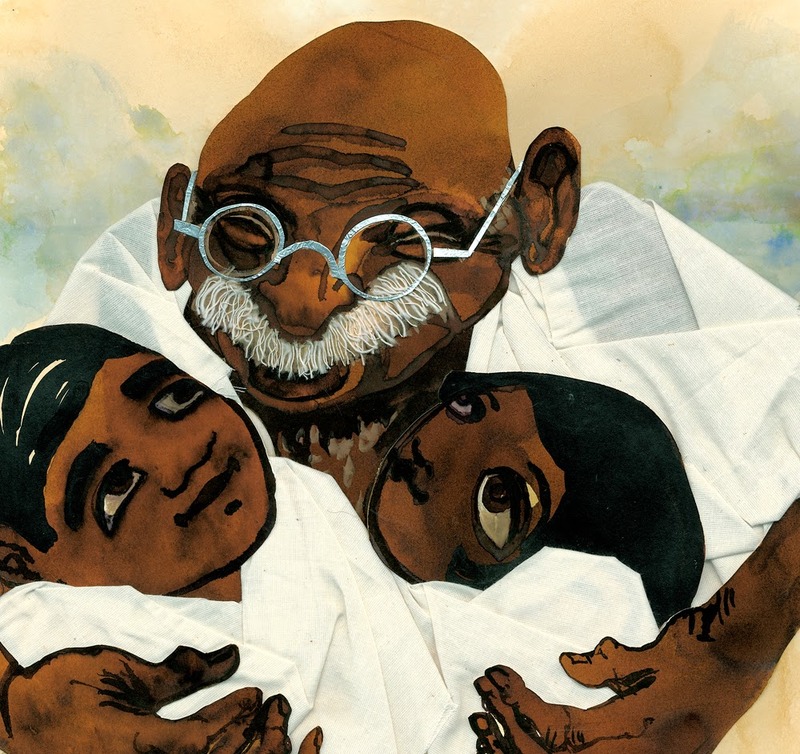 Shortly after that, she contacted Arun Gandhi, and out of their interactions came the picture book memoir, GRANDFATHER GANDHI. Arun Gandhi was twelve when his family traveled from their home in South Africa to spend two years in India with his famous grandfather. Arun's feelings about his grandfather were mixed-- he was awed by all that he had done and a little jealous of the time his grandfather spent with other people. Arun despaired of ever being a "Gandhi," or learning to manage the anger that sometimes boiled up inside of him. "…Anger is like electricity. It can strike, like lightning and split a living tree in two…or it can be channeled, transformed, and it can shed light, like a lamp…then anger can illuminate. It can turn the darkness into light. I did my best to live my life as light." Evan Turk's multimedia collage illustrations are fabulous, maybe even good enough to be considered for the Caldecott. When I learned he was from Colorado (although he currently lives in New York City), I had to check out his website. He has his own picture book coming out soon! Make no little plans, they have no magic to stir men's minds. "It was ten months until the next World's Fair. But everyone was still talking about the star attraction of the last World's Fair. At eighty one stories, France's Eiffel Tower was the world's tallest building. It's pointy iron and air tower soared so high that visitors to the top could see Paris in one breathtaking sweep. Now it was America's turn to impress the world at the 1893 Chicago World's Fair. But what could outshine the French tower? And who would build it? A nationwide contest was announced… "
A mechanical engineer, George Washington Gale Ferris, Jr. and his partner, William Gronau, won the contest with their invention- a tall steel structure that moved. But then they had to build it. In the dead of winter. In Chicago. On a site that had 35 feet of quicksand. And no one wanted to finance it. 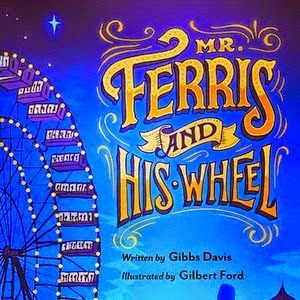 MR. FERRIS AND HIS WHEEL is a book about creativity. And perseverance. And collaboration. The book includes a kind of "double text." One text tells the story of Ferris and his invention, the other adds interesting facts about the World's Fair, the construction process, related cultural icons, etc. From a teacher point of view, I think you could put MR. FERRIS in a study of narrative nonfiction. Or a perseverance theme study. Or do great compare/contrast thinking by pairing it with Megan McCarthy's, POP: THE INVENTION OF BUBBLE GUM. A book I know kids are going to love! 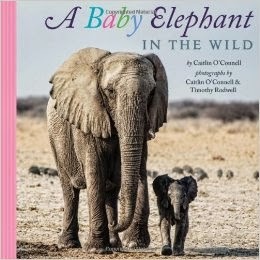 Caitlin O'Connell, a professor at Stanford University, has spent the last twenty years studying elephants. She was in her research tower in Namibia the night that Liza, a baby elephant, was born, and heard her cries shortly after birth. She and her husband, Timothy Rodwell, a wildlife photographer and professor at UC-San Diego, then spent the next few months following Liza and her family. The resulting book, a fact-filled narrative beautifully captures the story of young Liza's life. Beautiful, full color nature photography enhances the story. A two-page "Did You Know?" spread gives further information about elephants.